Baby Luke made his debut on Thursday, December 14th at 6:10pm weighing in at a whopping 8 pounds 4 ounces and measuring 21 inches long. He has dark hair and chubby little cheeks and looks amazingly like his Mommy, Kathleen, in the face. He sports long arms, legs, fingers and toes that clearly indicate the donation of the long and lanky attributes of his 6 foot 6 inch daddy, Matthew. In a clear break from all the other Allen grandchildren’s births, Luke made his way into this world with little to no drama. No pre-eclampsia drama sending Dave and I scurrying across the United States in a whirlwind. No post-eclampsia worries making the first few days of his life wonderful and fearful at the same time. 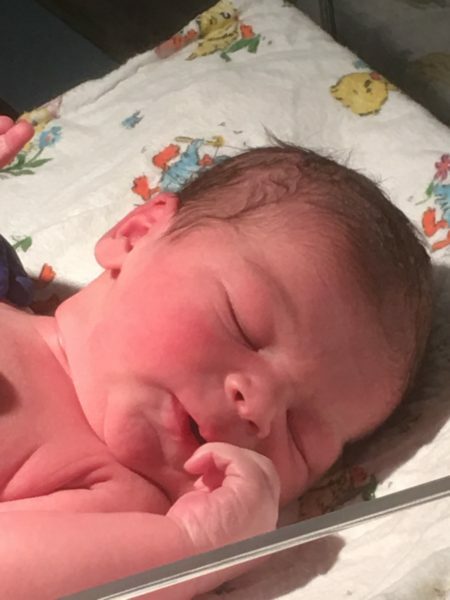 No C-section concerns for being too big to exit the womb and no risk of ending up in the Neonatal ICU for being too early to be able to breath on his own. He just declared his intention to exit, then graciously gave his Mommy just enough time to get to the hospital from her work in Nashville. When the doctor checked them into the hospital she said he would be born around 6pm. Sure enough, after just enough labor to make Mommy and Daddy realize that child birthing is hard, he squirmed his little way out into the world at 6:10pm. There is one thing I have always said about Matt—he is the king of understatement. His range of emotion is about an inch and a half. He is never despondent, elated or irate. He seems to hover his emotions pretty close to center. His basic tell of worry or anger is the way he clenches his jaw creating a gill-like flapping of his cheek muscles. His basic tell of elation is the way his beautiful blue eyes seem to dance with light when he is happy and excited. After I heard that Luke was born all I wanted was to see Matthew’s face. In that one quick look his sparkling eyes told me all there was to know. Standing at the nursery window, after counting all little Luke’s fingers and toes (twice for good measure), this Grandma exhaled a giant breath that she wasn’t completely aware she had been holding for the past few months. Our little Luke is here and everyone is safe and sound. Now we can get on to the fun part—Let the Spoiling Begin!